We finally settled on a new color for the ex-red room. It’s called Provence Creme from Behr and it’s a gorgeous creamy yellow, exactly what I had in mind when I said I wanted that room to be yellow. My dear man is finishing up the painting because he’s better with a roller than I am, and I’m getting a headache from the fumes, but here’s a picture of a finished area. We still need a second coat, and we’ll need to buy another gallon because the walls are drinking up the paint more than we expected, but this color is making me very happy. 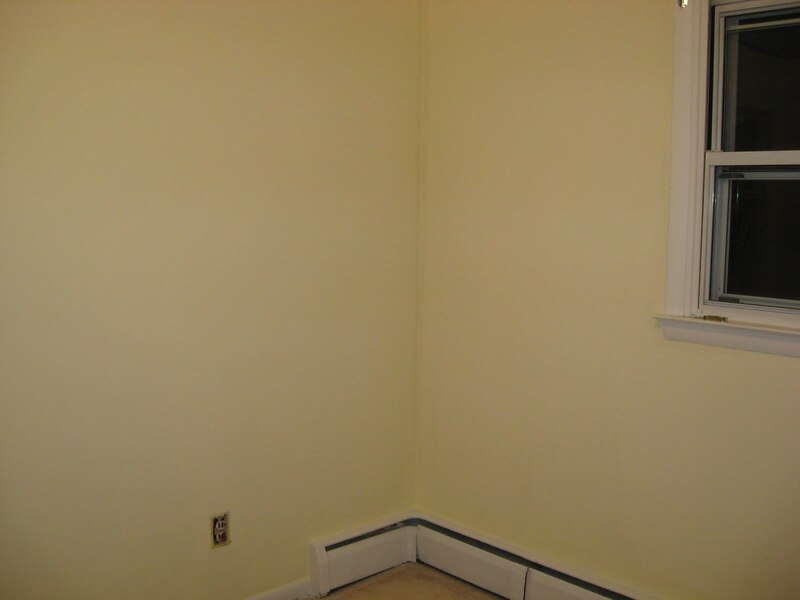 We’ll do the trim in an almost-white color called Vermont Cream (I know, this room is totally creamy), but that will happen in a few weeks when we find some more time. I’m concerned about the curtains now, because they’re beige and will probably look funny against the yellow, but I really don’t feel like spending more money on curtains. Does anyone care about how the curtains contrast with the paint? Honestly? Ok, I sort of do, but I’m hoping I’m being picky and most people wouldn’t even notice. This entry was posted in Uncategorized on March 13, 2011 by antijen. Looks very nice! Good yellow choice! As for curtains, I’d go with a color other than beige. I’ve had good luck finding simple panels at Target and JCP. But no one is going to judge you on curtains if you don’t feel like dealing with it! I’ll probably end up buying new ones at good old Target. It just stinks because I bought these beige ones when we moved in because there weren’t ANY curtains in the room, so I feel so wasteful replacing them so quickly! Maybe I can find another spot for the beige set.